Tyler Christopher performs about 200 Elvis Presley tribute shows a year, but says he is not an Elvis impersonator. The Alexandria, Ky. native, who performs close to 200 shows a year, will bring his unique take on Elvis performing live in concert Saturday from 7-9 p.m. at the senior center on Muntz Street in Hillsboro. Endless hours of practicing all the moves and gestures of Elvis came with a price — he wore out most of his father’s old VHS tapes getting everything right. 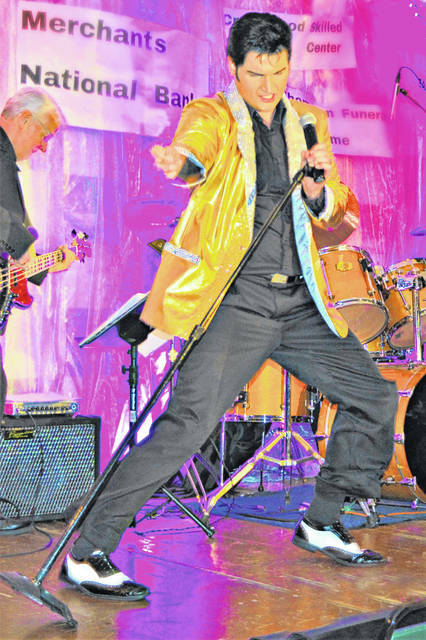 He said everything snowballed from there, but he is quick to point out that he isn’t an Elvis impersonator, but rather performs an Elvis tribute show at venues across the country. There is something about the persona of Elvis, Christopher said, and it surprised him that his music transcended all age groups from those like him that weren’t even born when Elvis was making records and movies, up through senior citizens who were there watching their TVs when Elvis first appeared on “The Ed Sullivan Show” on Sept. 9, 1956. Though Elvis has been gone for more than four decades and those that remember him continue to grow older, it amazes Christopher that from his perspective, the favorite son of Tupelo, Miss. continues to grow in popularity. Christopher said he strives in his tribute shows to accurately portray Elvis, and to bring to the stage a performance that illustrates how unique his concerts were along with his abilities as a master showman. Saturday’s concert at the senior center will begin with the early days of and rock ‘n’ roll and Elvis’ influence on it, Christopher said, and then will progress into music from his movies before going into the Las Vegas-era of the late ’60s and then winding up in the “Aloha from Hawaii” period of the early 1970s. The segment of his show that is from the time in Elvis’ life when he wore the legendary American Eagle studded cape and handed out scarves to his audience is the most memorable, he said, since he’s seen mothers and grandmothers literally fight over getting the coveted wrap while he’s on stage. Off stage, Christopher has been happily married for the past nine years to Carly, his “best friend that I grew up with since I was 12 years old,” and the couple volunteers in the deaf community. Meshell Frost, the executive director of the senior center, thanked the community and sponsors for their support of the concert, a fundraising benefit for the center, and though it has been sold out since Tuesday, she assured fans that Christopher will no doubt be back for another Elvis tribute show next year.